Zombs Royal Io this became a hit Zombs.io i in the fight for survival mode until the last player. Games in the style of Battle Royal become very popular! 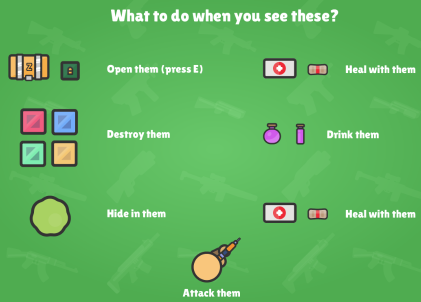 The task in Zombs Royale is to survive, destroy the rest or just survive 🙂 You have a weapon, there are all kinds of items. New items can be found in boxes (open with the button E). You can also be treated and drink bottles for a greater effect (wings like redbull). At the very beginning of the game I throw you out with a parachute, click at the point where you want to airborne. Next, look for boxes, smash them and take a weapon (button E). Do not forget to monitor the level of health and bullets. If in Zombs Royal and you are in a gas attack, dump as soon as possible to any safe place. In addition, you can hide in the bushes and wait for the enemy. Perhaps a bit boring, but relatively safe and effective. Zombs Royale io is another arena match for survival. For lovers of such games like royal battle, it is strictly necessary to try.